In 1696, Thomas Bray, an English country parson, was invited by the Bishop of London to be responsible for the oversight of Church work in the colony of Maryland. Three years later, as the Bishop’s Commissary, he sailed to America for his first, and only, visitation. Though he spent only two and a half months in Maryland, Bray was deeply concerned about the neglected state of the American churches, and the great need for the education of clergymen, lay people, and children. At a general visitation of the clergy at Annapolis, before his return to England, he emphasized the need for the instruction of children, and insisted that no clergyman be given a charge unless he had a good report from the ship he came over in, “whether … he gave no matter of scandal, and whether he did constantly read prayers twice a day and catechize and preach on Sundays, which, notwithstanding the common excuses, I know can be done by a minister of any zeal for religion.” His understanding of, and concern for, Native Americans and Blacks were far ahead of his time. He founded thirty-nine lending libraries in America, as well as numerous schools. He raised money for missionary work and influenced young English priests to go to America. Bray tried hard to have a bishop consecrated for America, but failed. His greatest contributions were the founding of the Society for Promoting Christian Knowledge and the Society for the Propagation of the Gospel, both of which are still effectively in operation after two and a half centuries of work all over the world. 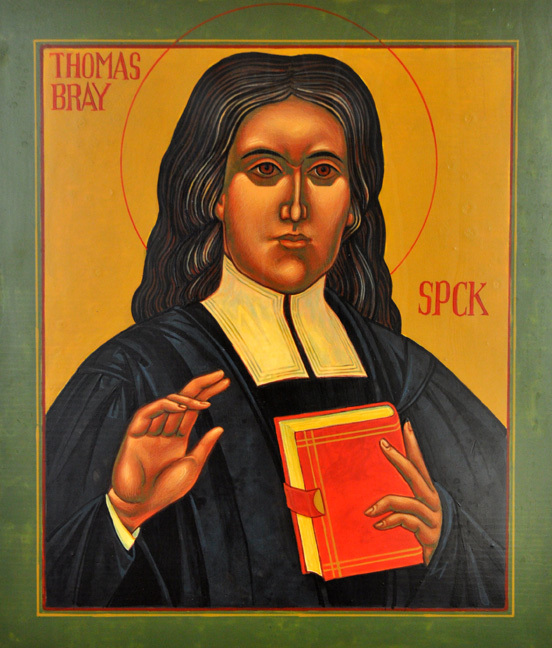 From 1706 to 1730, Bray was the rector of St. Botolph Without, Aldgate, London, where, until his death at the age of 72, he served with energy and devotion, while continuing his efforts on behalf of Black slaves in America, and in the founding of parochial libraries. When the deplorable condition of English prisons was brought to Bray’s attention, he set to work to influence public opinion and to raise funds to alleviate the misery of the inmates. He organized Sunday “Beef and Beer” dinners in prisons, and advanced proposals for prison reform. It was Thomas Bray who first suggested to General Oglethorpe the idea of founding a humanitarian colony for the relief of honest debtors, but he died before the Georgia colony became a reality. I O God of compassion, who didst open the eyes of thy servant Thomas Bray to see the needs of the Church in the New World, and didst lead him to found societies to meet those needs: Make the Church in this land diligent at all times to propagate the Gospel among those who have not received it, and to promote the spread of Christian knowledge; through Jesus Christ our Lord, who liveth and reigneth with thee and the Holy Spirit, one God, for ever and ever. Amen. 1. The collect has much to recommend it, but like so many others it completely lacks a “so that” dimension, leaving the petition to serve as a “to do” list for God, with no stated connection to the lives of the individuals and congregations praying the prayer. I find that disappointing, as a person praying the collect and feeling a resonance with the life of Thomas Bray, and also presumptuous and overbearing, as a person advising God on what he should be sure to do (even though I do it all the time). 2. The words “in this land” reflect Bray’s connection with North America, but seem unnecessarily restrictive and provincial considering the things asked of God need to be done by the church everywhere. Along with that, despite the collect’s phrasing alluding to the societies Bray founded, no aspect of his work in England is mentioned. 3. In the clause about propagating the gospel, the words, “among those who have not received it“ are self evident and unnecessary. Who would “propagate it” among those who already HAVE it? (4A) “You opened the eyes of” suggests he had them closed to begin with. A more apt affirmation could be made there. (4B) That Bray saw “the needs of the Church” may be shorthand for seeing the needs of God’s people in North America, seeing the daunting handicaps hindering performance of the Christian mission well, and seeing the shortcomings suffered as the Church struggled to overcome many challenges (some self inflicted such as lack of episcopal presence and others occasioned by circumstance), but simply to say he saw “the needs of the church” puts the emphasis on a self regarding stance of neediness rather than on the initiative required to accomplish God’s life-giving work. That expression could be revised. (4C) The whole perspective of the collect is earth-bound and institutional, i.e., it has no reference to anything salvific or eschatological. Even the ending (through JCOL) sounds sparse and perfunctory. Would it be possible in this prayer to make mention of God’s grace bearing fruit? This commemoration may well be used by people in Haiti, Virgin Islands, chaplaincies of Armed Forces in various places, some ministries in Europe, etc. “In this land” will be an odd phrase when used in some places. It’s not needed in the prayer, adds nothing positive with regard to the commemoration, and restricts our concern for God’s work based on geography, suggesting an indifference to basic aspects of God’s work elsewhere. I’d eliminate the phrase altogether. Bio. A ‘who he is’ and ‘why he is important’ statement; and ‘He died in 1730.’ statement would be helpful. Given how influential (for better or worse) the work of the SPG was in giving our church the character it has, I’m surprised the bio doesn’t say more about it. I agree with John that the collect could be improved. Almost all the criticisms made regularly on this blog of other collects apply to this one too. I won’t bore everyone by repeating the ones I’ve made. Elie Naud [Elias Neau] (1661-1722) (September 7). I realize that the history of the SPGFP is contentious, including slaveholding in the Carribean. Yet, Anglicanism would have struggled even more than it did in the American colonies with the Society’s support. Also the phrase “numerous schools” is just too vague. I don’t have any really good alternative, but “priest and missionary” just isn’t right for Bray. “Priest” is a status, not a contribution. (I’ve got the same problem with Cyril and Methodius – what matters is not that they were “monk and bishop” but that they were “the Apostles to the Slavs,” as the churches that grew out of their efforts style them.) To use titles – whether “bishop,” “abbot,” “deacon,” or whatever – is like heading brief biographies of secular figures as “Alexander of Macedon, king,” “Horatio Nelson, naval officer,” or “Albert Einstein, professor.” If their title is the most important thing about them, they’re not worth remembering. And “missionary” is a poor description of a country parson who spent less than 90 days overseas. Bray’s lasting contributions were as one of the founders of the SPG and SPCK and a champion of the neglected, but HWHM has buried the lead. The bio also doesn’t take into account more recent scholarship (for example, John K. Nelson’s A Blessed Company and Edward L. Bond and Joan R. Gundersen’s The Episcopal Church in Virginia 1607-2007) showing that conditions in the colonial churches were not nearly so bad as later Tories and evangelicals painted them. Only about 10% of the parish clergy were found to be incompetent, corrupt, or even lax, a percentage not too far removed from what prevailed in England at them time or, for that matter, from current conditions, despite our abundance of bishops and greatly improved means of episcopal monitoring and oversight. Of course, when you’ve been sent over to correct abuses and are being paid a modest stipend for your trouble, it’s not easy to write back to the bishop who dispatched you that you haven’t found many abuses and that colonial parishes – or at least those that have clergy at all – seem to be about as healthy as those at home. However, Bray, for one, seems to have done just that. His “Representation” of 1700 (http://www.mun.ca/rels/ang/texts/bray.html) laments that here are too few clergy in the American colonies and that they are inadequately supported. He says nothing that would suggest that those who were there were of remarkably poor quality. Bray’s equally admirable colleague James Blair found that Virginia was in far greater need of a school to train new clergy than of an overseer to discipline the existing rectors, so he founded the College of William and Mary and devoted his considerable energies to building up the college and seeing to the proper functioning of the (secular) colonial government. Joan Gundersen has written at least one other criticism of criticisms of the Episcopal Church in Virginia and other places in the south (she wrote a scathing review of Bishop Paul Marshall’s biography of Samuel Seabury, on the grounds that Marshall used material reflecting unfavorably on churches in the south–although there was quite a lot of other material in the book and that wasn’t the main topic of the book). She is somewhat prejudiced, I find, against “evangelicals” in general and quite defensive of the church in Virginia. I would like to see some sort of symposium of writers on the history of the church in America, with each writer contributing bibliographies, etc. –Joan also took issue with a recent history of the Diocese of Pittsburgh, so much so that it was not mentioned in lists of available materials on the diocese. I think it’s good to have the issues of historical interpretation out in the open, but I don’t think it’s good to discredit whole books without opportunity for the issues to be discussed by historians on various “sides” of issues to say why they reached their conclusions. Open discussion, I think, gets us farther than shutting discussion off. When we did this commemoration at our Eucharist this morning, there was an awkward pause at the end of the Epistle, as everyone waited expectantly for the rest of the familiar sentence, which of course runs on to verse 7. The lector got some quizzical looks when, instead of continuing past the comma, said “The Word of the Lord” and sat down. The reading may fit the commemoration better as truncated, but I’m not sure it still says what Paul meant. Though this is a bit off topic, I think it illustrates the difficult conditions that some Anglican clergy encountered when they labored in what would be considered rural areas. The Rev. John LaPierre was born to Huguenot parents in France in 1681. After the Revocation, the family fled, and La Pierre went to Ireland and then England. He was ordain in 1707 by Henry Compton, Bishop of London, the same man who commisioned Thomas Bray to go to Maryland. The Rev. John LaPierre was one of the first priests to be sent out by the Society for the Propagation of the Gospel to Foreign Parts when he went to what is now Charleston, SC. His employment there was requested by the governor of the colony who wanted to bring the Calvinist French speaking Huguenot settlers into the Anglican conformity. The Rev. John LaPierre who was fluent in French and Enlgish worked in the Charleston area for 20 years before moving to the Cape Fear area of North Carolina in 1728 or 1729. He moved to New Bern and then to Brunswick where he lived until his death in 1755. He preached before the General Assembly of North Carolina in 1749 for which he received a 4 pound stipend. LaPierre was married to Susannah and they had three daughters and 2 sons. Susannah was blind. I preached my senior sermon in chapel for this commemoration, and I must say that I really felt that the readings that were selected for the commemoration were spot on. After studying more about Bray, in preparation of the sermon, I felt like in many ways that Luke 10:1-9 would have been his self chosen Gospel text for his life and ministry. I also found that there was an abundance of primary sources available to pull on for Bray. In them I learned that in part, he brought two other missioners with him to the new world, this seemed like an appropriate link to be made with the Gospel text. We are called in “pairs” to do the work….Bray too wasn’t alone in his work. I suggest changing the subtitle to ” Founder of Missionary Societies”. That he was a priest and missionary is self-evident in the text. Line 11, first paragraph: substitute “in which he crossed the Atlantic” for “came over in”. Line 3, third paragraph: add “there on February 15, 1730” after “death”. P. I Line 16, first paragraph: add a comma after “Blacks”.